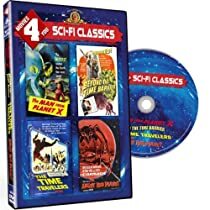 Get ready for the adventure of a lifetime when The Classic Sci-Fi Ultimate Collection returns with 5 captivating science fiction films from the golden age of Hollywood! Featuring groundbreaking special effects, these classic films help set the standard for all sci-fi terror to come. Titles include Dr. Cyclops, Cult of the Cobra, The Land Unknown, The Deadly Mantis and The Leech Woman. These movies are all favorites of mine. They are good movies. Great sci-fi and some great actors. In the Deadly Mantis, you get William Hopper, Paul Drake from Perry Mason. And Peter Gunn himself Craig Stevens. In Dr. Cyclops the great actor Albert Dekker and Paul Fix, Micah on the Rifleman. In the Land Unknown the great Jock Mahoney himself. He played Tarzan twice, and was a Cowboy Star and even appeared with the Three Stooges. The Cult of the Cobra is loaded with household names, David Jansen, and Richard Long to mention a couple. Great movies, and the special effects really aren't bad if you take into account the Times. Definitely worth your money. Buy it. Once again the films -- matinee fare originally, and late night TV fare since -- are very well presented, And all are of at least some interest. Some struck me as not quite Sci-Fi, More quirky stories that fall outside the realm of the real. And the two that are more typical `50s sci-fi/Monster are in truth the weakest in the set. Dr. Cyclops is perhaps the most interesting. More for the excellence of it "effects" -- something that might suggest it is a newer film, but it -- in full color yet -- actually dates from 1939 -- than for its story. Others border on the occult and weird. Categories aside these are some pretty interesting matinee films. Worth seeing if not quite worth coveting. I bought this set mainly for two movies I remembered from my childhood. One was 'Dr. Cyclops' and the other was 'The Deadly Mantis'. I thought that 'The Deadly Mantis' would still be my favorite, but the rich color print of 'Dr. Cyclops' was awesome. Albert Dekker was great as the single-minded scientist (or should we call him mad!) shrinking interfering people to a more manageable size. 'The Leech Woman' was a portrait of the ultimate life draining shrike. 'The Land Unknown', I'd never seen before, but being it was a pretty old black and white, I was prepared for the old timey special effects. It was still pretty good. Not much to say about 'Cult of the Cobra' with a very young David Jansen.